So you’ve landed your dream pediatric occupational therapy job and are looking for some new ways to engage your kids in therapy. Sensory bins are the best activities for new grad OTs working in pediatrics. You are able to keep in mind their sensory needs and their goals. 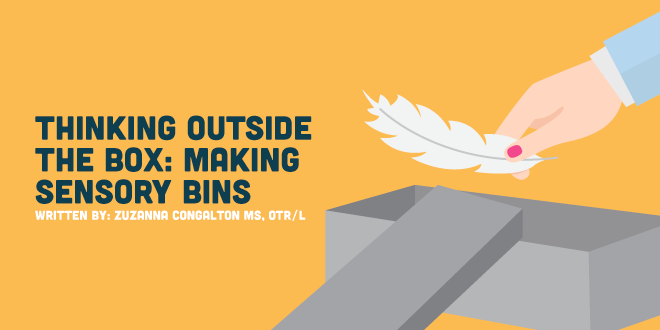 Making sensory bins is easy to learn because they are made with recycled everyday items and make exciting activities for the kids! With many of us working in various pediatric settings, sensory bins are a go-to activity to help keep kiddos engaged and always provide the OT with an opportunity to address specific goal areas. Sensory bins are a favorite way to incorporate many senses while addressing fine motor skills, visual perception, tactile defensiveness, grip strength, grasp development, sequencing and let’s be honest, attention. Here are a few sensory bins you can make with anything laying around in the setting you work in, at home, or at your best friend… the dollar store! Simple and effective! Activities don’t have to be fancy. Kids can engage in the most seemingly simple materials when the activity is structured to be the just-right challenge. These sensory bins can travel with you especially if you work in a school setting, do home visits, or multiple outpatient clinics.